I created this dance based on concepts of industry and the assembly line called Mass Production. I wanted to incorporate a machine/factory feel for the work, so I had a large table prop built which the dancers manipulate in various ways as well as dance on, over, under, and around. The cast included 6 dancers wearing coveralls to complete the industrial imagery and the movement was very linear and repetitive. 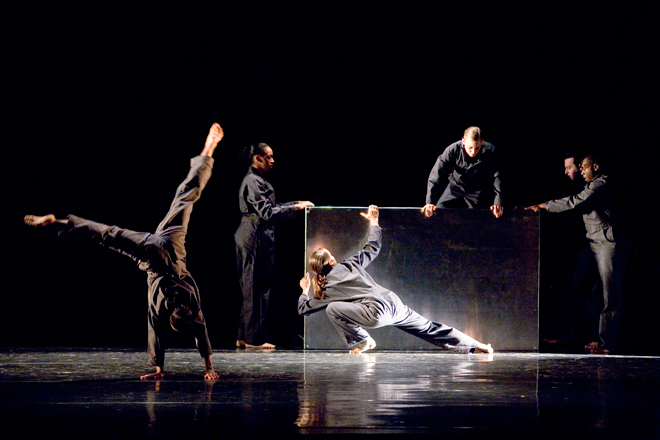 Since its creation for the ARDT concert, Mass Production has been performed by the contemporary dance company, Sanspointe, in Birmingham (May 28-31, 2009) and seen at the Panoply Regional Choreography Competition in Huntsville (April 2009). The work was also taken to the American College Dance Festival Southeast Regional Conference in Murfreesboro, TN in the Spring of 2010 and was adjudicated by a panel of international dance specialists. Mass Production was one of 12 dances selected from 45 to be presented in the gala. I am honored this dance has been received so well by so many different audiences!